March 24-31st is Farmworker Awareness Week, as organized by Student Action with Farmworkers. Farm work is necessary to feed us all, yet farm workers have been left out of most labor law protections that other types of workers enjoy such as the minimum wage and the right to organize. The Coalition of Immokalee Workers (CIW) has been working to raise awareness and improve conditions for workers in South Florida through their Penny-Per-Pound campaign (which many major retailers and fast food chains have agreed to, but so far Publix has refused to participate in). It is worthwhile to consider that paying one cent more per pound on tomatoes could yield a real quality of life difference for workers when they are paid by the pound, and a day’s work can consist of picking up to 2,000 pounds of tomatoes in a day. Shocking cases of modern day slavery have been prosecuted in court, including many in Florida. Unfortunately even when you buy local, you aren’t necessarily guaranteeing fair treatment for workers. Many farms don’t comply with the law in regards to providing workers compensation insurance for one of the most dangerous jobs, and workers are left on their own and without a job should they become unable to work due to injury or illness from pesticide exposure. When you buy organic it’s good for your health, but you are also protecting the health of workers, too! We hope you will visit some of these links and educate yourself and your family and friends on these important issues. Farm work is one of the original jobs most people have outsourced when it comes to daily living. Let’s not forget the hands that feed us, and give thanks and appreciation for everyone who handles our food at some point in it’s journey to our plates. We would also like to share with you how we do things at our farm. 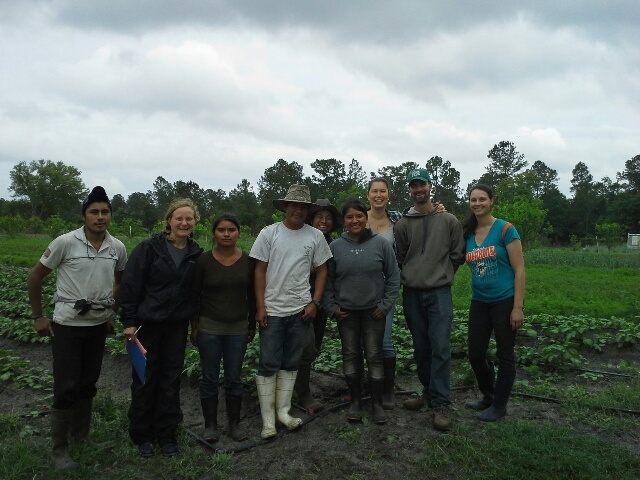 We do work long hours and most of our crew works six days per week – there is not much that is going to change about the “work” part of farm work. Yet there are many differences in how jobs are structured on our farm compared to the typical small-to-medium sized farm (we have technically reached the USDA’s definition of a medium-sized farm). At Frog Song Organics, we currently pay all part and full time staff above minimum wage. For all full time staff we provide five days of paid sick leave, four paid holidays, a life insurance policy and three hot, prepared meals for our crew each week which we eat together as “farm lunch.” In addition, we provide housing for our field crew who live on the farm as our neighbors. We also pay for workers compensation insurance, which is required by law, but is lacking on many farms especially those who depend on undocumented workers. We currently employ eight full-time staff (most of them pictured above) and five part-time staff, from both the United States and Mexico. Several of our staff work with us through the the H2A guest worker visa program, which requires us to have: contracts with workers guaranteeing minimum hours and defines wages, inspections for housing and water supplies, and pay for round trip travel from Mexico. It is our goal to provide a good quality of life and meaningful work for everyone who works with us. We have continually worked to improve both the wages and benefits that we can offer as a start-up and small employer. We’ve come a long way from our beginnings working with family, friends and volunteers, to having paid apprentices/interns, to being able to provide full time, year-round work with modest benefits. We hope to add health coverage within the next 2-3 years, and with the support of our CSA members, farmers market and restaurant customers we are making steady progress towards that goal.